The Premier League 2013-14 season attracted the highest average gates in top-division football in England in 64 years, Sportingintelligence can reveal. The average number of tickets sold per game was 36,695 last season – the highest figure in the Premier League era and the biggest in England’s top division since 1949-50. Despite a number of fan-lead protests against the rising cost of watching matches last season, a total of 13,944,100 fans attended the 380 matches, a two per cent increase on the previous campaign. 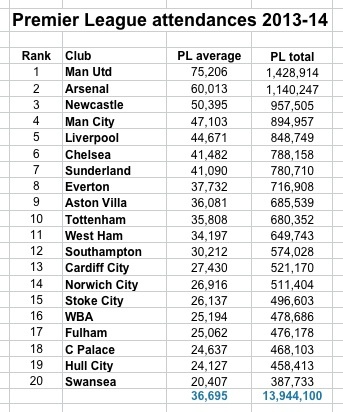 The previous capacity record in the Premier League era came in the 2007-08 season when average crowds reached 36,149. Last season also produced a record seat occupancy rate figure of 95.9 per cent, according to official Premier League figures. The previous highest seat occupancy rate in the Premier League era was 95.3 per cent during the 2012-13 season. 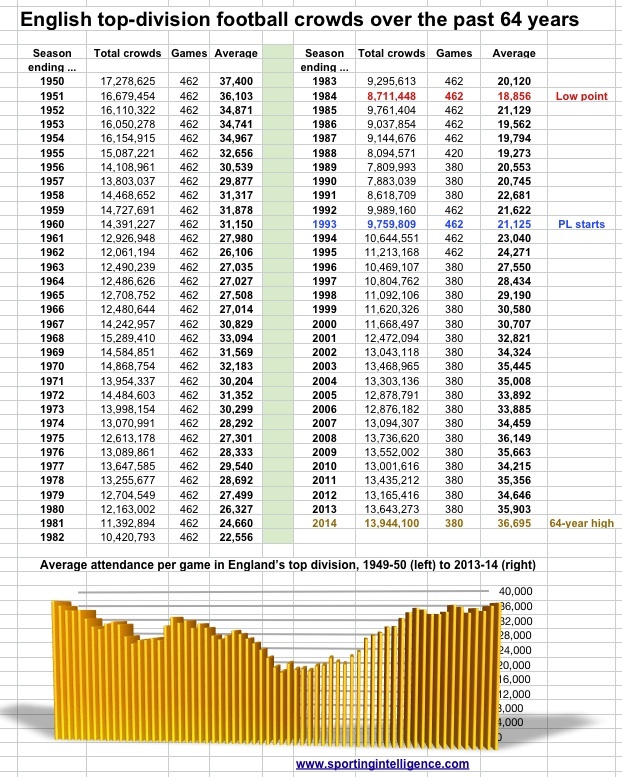 The last time average gates in the top division were as buoyant was in 1949-50 when 17.3m watched 462 matches – at an average of 37,400 per game. Since then the top-flight has been reduced from 22 teams to 20 meaning there are only 380 Premier League games each season. Here are the club by club attendances for 2013-14. The Premier League is the second best attended football league in the world in average gates, behind only the Bundesliga, which averages more than 40,000 fans per game. If you wanted to create a Premier League with the maximum possible attendance potential based on current available capacity at clubs around the country, it would include both Sheffield clubs, Leeds, Middlesbrough, Derby, MK Dons and Blackburn, as below. 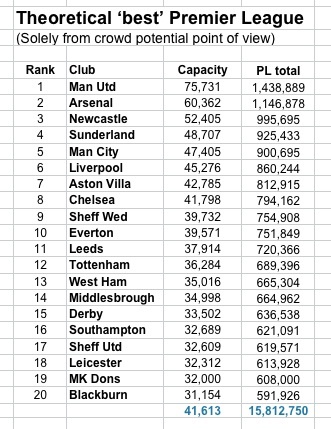 That make-up of clubs, at full capacity, would attract 15.8m people in a season at an average of 41.613 fans per game.